I am a huge film buff, i devour special features and am in awe of the amazing talents that go into making a feature film. I am an especially big fan of concept art, ever since i got my hands on the Return of the Jedi sketchbook as a kid i've been addicted to it. So this weeks theme for sketch-o-rama was to do our take on a classic Spiderman villain for a future installment of the Spiderman film franchise. 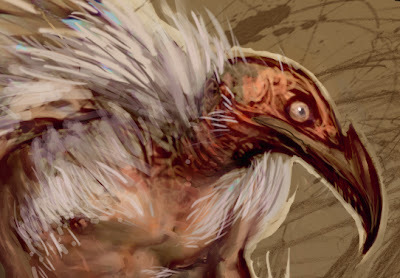 I jumped all over the Vulture. 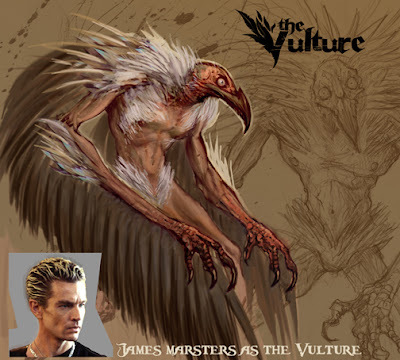 I chose to cast James Marsters in this role because he not only has the physical looks to match the character but he also has the charisma needed to play one of Spidey's classic villains. I also re-interpreted the character as a monsterous, tragic figure. 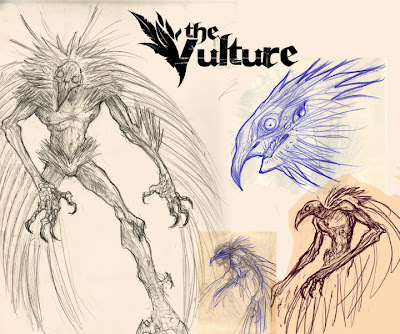 In my version, the vulture undergoes a horrifying physical and mental transformation, ala' Seth Brundle in the Fly. As always, there is more awesomness from my peers over at Sketch-O-Rama. I always liked The Vulture too - if for no other reason than it was funny watching Spidey throw down with a geriatric escaped prisoner. That said, I'm totally digging your thoughts here - transformation, casting choice and all. that's pretty tight parce, i like your take on it. that's cool! great take on the character. That looks awesome is it in photoshop? EXELENT i admire in this one to your brush strokes and energy that comes out and astonish us viewers. Great man fkn great.